Armed Police have opened fire and shot an intruder inside the grounds of the Houses of Parliament amid reports a car drove into pedestrians on Westminster Bridge. An intruder with a knife managed to break into the grounds of Parliament and stabbed a police officer before he was shot, reports suggest. More than 10 people are said to have been hit by a car on Westminster Bridge after a vehicle described as a ‘4×4’ reportedly drove into pedestrians and cyclists. 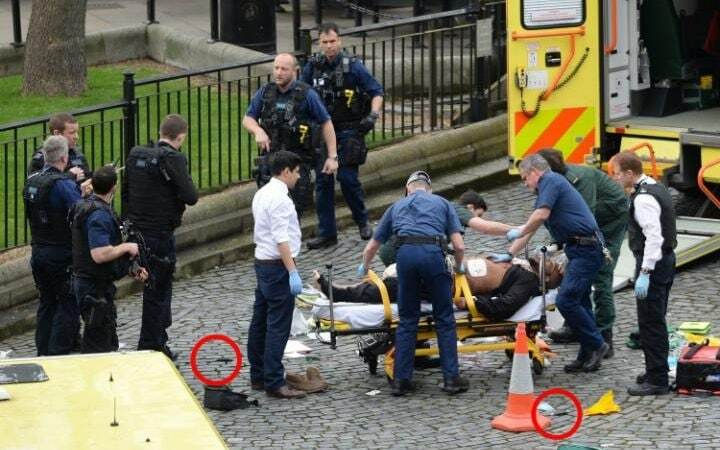 Three bodies were visible on the floor outside Parliament and the Palace was placed on an immediate lock down. Prime Minister Theresa May is said to have been bundled into a car by a plain-clothes police officer and driven quickly from the scene. At least 20 people were hit when a 4×4 drove along the pavement on the crowded bridge, knocking down and seriously injuring pedestrians before crashing into a fence below Big Ben. 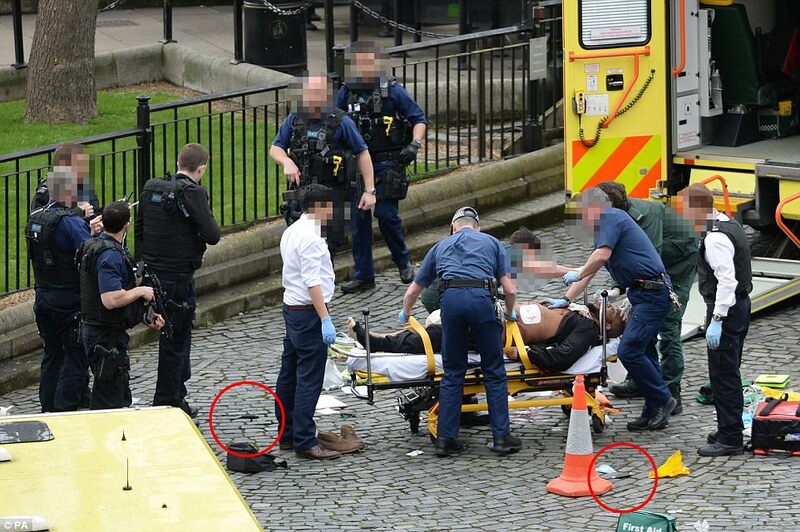 The killer, described by witnesses as ‘middle-aged and Asian’, then managed to break into the grounds of the Parliament where he fatally stabbed a police officer with two knives. The policeman died at the scene. The attacker, who was shot by armed officers, died after he was taken to hospital. It is currently believed one attacker was involved and he killed three people, including the policeman, and left at least 20 pedestrians and three other police officers seriously injured. Prime Minister Theresa May was bundled into her car by a plain-clothes police officer and driven quickly from the scene as the attack unfolded. She will chair a meeting of the Government’s emergency Cobra Committee tonight. Scotland Yard said the attack, which comes a year to the day after the terrorist atrocities in Brussels, is being treated ‘as a terrorist incident until we know otherwise’. 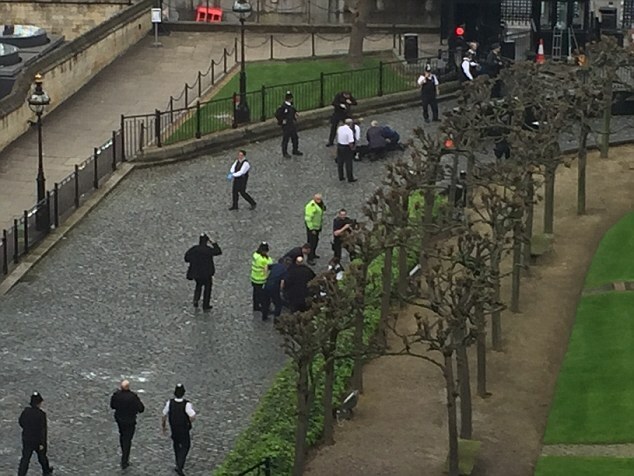 A police officer was killed by a knifeman (pictured on stretcher) before the attacker was shot by other officers outside Parliament today. The suspected terrorist is also dead, along with two pedestrians killed when the attacker drove a 4×4 across Westminster Bridge, ploughing down and seriously injuring at least 20. Isil supporters have cheered the attack on Westminster, suggesting it was “revenge” for the UK’s airstrikes on the terror group in Syria and Iraq. Followers on pro-Islamic State of Iraq and the Levant channels on the social media service Telegram posted messages applauding the knife-wielding suspect and called the attack “blessed”. One said the UK was paying “blood for blood” for its involvement in the US-led coalition’s campaign against the jihadists. “Our battle on your land is only just beginning,” read one poster next to a photoshopped image of Big Ben being blown up. The Chinese military issued a warning to a U.S. Air Force B-1 bomber flying in the East China Sea Wednesday morning amid escalating tensions in the region, two U.S. officials told Fox News. The Chinese said the U.S. bomber was flying in Chinese airspace. Both American officials said the bomber was flying in international airspace and continued on its mission. The Chinese warning came over the emergency radio frequency known as “guard,” according to one official. The incident occurred when the American bomber was flying 70 miles southwest of the South Korean island of Jeju. The episode occurred amidst rising tensions with North Korea, which tried to launch another ballistic missile Wednesday, but failed. North Korea’s latest missile launch ended in catastrophic failure as it appeared the projectile exploded within seconds, say US officials. The launch made near the city of Wonsan, on North Korea’s east coast, was detected by Japanese, South Korean and American systems, leaving those countries scrambling to find out more about the type of missile that was launched and why it failed. Neighbouring countries were preparing for the possibility of additional launches after the failed weapons test. North Korea has launched a series of tests in recent months, with Wednesday’s launch coming after the nuclear-armed state claimed it had made a major breakthrough in its rocket programme. An American-backed Syrian Kurdish coalition said Wednesday that the US had landed infantry behind Islamic State lines to spearhead an assault on the town of Tabqa. The Syrian Democratic Forces said the US airlifted several Marines and SDF fighters by helicopter into Islamic State-held territory, capturing four villages, and cutting the main artery running between the terrorist group’s self-proclaimed capital of Raqqa and the western countryside. It was not immediately possible to confirm the deployment with US commanders. The group said in a statement on social media Wednesday that the operation was in preparation for an assault on Tabqa, an IS redoubt 45 kilometers (28 miles) west of Raqqa. The activist-run group Raqqa is Being Slaughtered Silently said 500 US and Syrian Kurdish forces were deployed in the operation Wednesday morning. The group relies on local contacts to smuggle information out of IS territory.Earlier this month, a couple of hundred Marines were deployed into Syria with heavy artillery guns, as part of the preparations to oust the IS from Raqqa. The Marines moving into Syria were pre-positioning howitzers to be ready to assist local Syrian forces, a senior US official said at the time. Images of Americans inside the Iraqi city of Ramadi have roiled ISIS supporters, who are calling online for anyone near the western city to attack them. A pro-ISIS channel on Telegram posted that over 60 American soldiers are in Ramadi, specifically seen inside Anbar University and being escorted by Iraqi security forces and tribal militiamen. The U.S. State Department’s Bureau of Political-Military Affairs tweeted earlier this week that it was “demining work targets stockpiles of homemade explosives, IEDs, and improvised ordnance” and “clearing the mess” in one of Ramadi’s schools. While ISIS was routed out of Ramadi nearly a year ago, the terror group has sympathizers and former members in towns on its outskirts. The presence of U.S. officials has been keenly monitored on the ground. The French presidential candidate François Fillon has been hit by allegations he was paid $50,000 (£43,000) to arrange a meeting between a Lebanese billionaire and Vladimir Putin as prosecutors investigating whether his wife was paid for fake jobs widened their inquiry into whether she had signed forged documents. The latest accusations came a week after Fillon, 63, was formally put under investigation for a misuse of public funds over the €700,000 of taxpayers’ money British-born Penelope Fillon earned for acting as his parliamentary assistant. French media reported on Tuesday that the inquiry was examining suspected “aggravated fraud, forgery and use of forgeries” to claim she had worked when she had not, which her lawyer denies. The allegations of Fillon’s role in a meeting between the Russian president, Lebanese businessman Fouad Makhzoumi and Patrick Pouyane, the chief executive of energy giant Total, were made in the latest issue of the satirical newspaper Le Canard Enchainé, which broke the alleged ‘fake jobs’ scandal in January. The article said Fillon’s consultancy company 2F Conseil had earned $50,000 for setting up the 2015 meeting. Fillon’s spokesman vigorously denied the allegation, saying Canard Enchaîné’s “insinuations” were “completely without foundation”. The Kremlin dismissed the report as “fake news”. A Russian lawyer who represents the family of Sergei Magnitsky is in intensive care after falling from the fourth floor of his apartment building, according to unconfirmed reports. The Russian newspaper Novaya Gazeta suggested Nikolai Gorokhov had fallen after a winch snapped as he tried to lift a bath to a fourth-floor apartment, though details of the incident remained murky. Magnitsky uncovered a massive fraud that implicated government officials, but was himself arrested in 2008 and died in prison in 2009, amid allegations he had been tortured and medical care had been withheld. Russia later put him on trial posthumously for tax evasion. Gorokhov, 53, has represented the Magnitsky family since 2011, and was due in court on Wednesday as part of a case brought by Magnitsky’s mother against some of those allegedly involved in the fraud he uncovered. World leaders will gather for talks on how to defeat the Islamic State today after it emerged that an aircraft cabin ban on electronic devices was prompted by warnings of a new terrorist threat. During the presidential campaign, Donald Trump said he had a “secret plan” to defeat the Islamic State of Iraq and Levant (Isil) and pledged to “bomb the hell out of” the terror group. He has ordered his administration to “develop a comprehensive plan”, but is yet to set out the details. Rex Tillerson, the US Secretary of State, will today host the first full meeting of the international coalition against Isil since 2014. Boris Johnson, the Foreign Secretary, is attending the major 69-nation conference in Washington DC. It comes as British passengers on holiday flights from the Middle East and North Africa were told they would be banned within days from carrying laptops, tablets and other electronic devices on board the aircraft. Manafort proposed in a confidential strategy plan as early as June 2005 that he would influence politics, business dealings and news coverage inside the United States, Europe and the former Soviet republics to benefit the Putin government, even as U.S.-Russia relations under Republican President George W. Bush grew worse. Manafort pitched the plans to Russian aluminum magnate Oleg Deripaska, a close Putin ally with whom Manafort eventually signed a $10 million annual contract beginning in 2006, according to interviews with several people familiar with payments to Manafort and business records obtained by the AP. Manafort and Deripaska maintained a business relationship until at least 2009, according to one person familiar with the work. The ban of carry-on electronics on flights was prompted by intelligence gathered about an ISIS plot to target the West. The US and UK announced restrictions on large electronics in carry-on baggage for direct flights from certain Middle Eastern and North African nations on Tuesday. The move is allegedly based on the suspicion that Islamic State are working on ways to smuggle explosives on to planes by hiding them in electronics. Information was gathered during a raid against al Qaeda in Yemen in January that killed Navy SEAL senior chief petty officer William ‘Ryan’ Owens. The intelligence centred around al Qaeda’s ‘successful development’ of compact battery bombs that fit inside laptops or other devices, sources claimed. 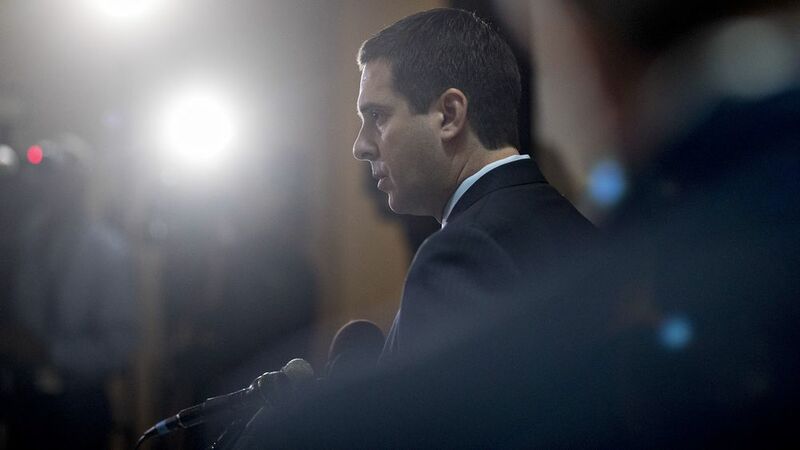 Devin Nunes, a Republican from California and chairman of the House Intelligence Committee, speaks during a news conference on Capitol Hill in Washington on Feb. 27, 2017. House Intelligence Chairman Devin Nunes said Wednesday that the U.S. intelligence community collected multiple conversations involving members of Donald Trump’s transition team after he won the election last year. He said the intercepts he’s seen appear to be legal and weren’t targeted at the transition team or related to an investigation of Russia’s attempts to influence the U.S. presidential election. But he said he was troubled by the collection — which he described as part of unrelated foreign surveillance — and that the intelligence community reported the names of transition team members internally. Nunes told reporters outside the White House, where he briefed the president on his findings, that “it is possible” Trump’s tweets were correct concerning surveillance. It was previously disclosed that U.S. intelligence agencies had picked up conversations between Michael Flynn, Trump’s first national security adviser, and the Russian ambassador to the U.S. before Trump’s inauguration. Flynn was fired in February after making contradictory statements to Vice President Mike Pence about those discussions. Five people employed by members of the House of Representatives remain under criminal investigation for unauthorized access to Congressional computers. Former DNC chair Debbie Wasserman Schultz employed at least one of those under investigation. The criminal investigation into the five, which includes three brothers and a wife of one of the men, started late last year, as reported by Politico in February. The group is being investigated by US Capitol Police over allegations that they removed equipment from over 20 members’ offices, as well as having run a procurement scheme to buy equipment and then overcharge the House. House Speaker Paul Ryan said last week Capitol Police are receiving additional help for the investigation. “I won’t speak to the nature of their investigation, but they’re getting the kind of technical assistance they need to do that, this is under an active criminal investigation, their capabilities are pretty strong but they’re also able to go and get the kind of help they need from other sources,” Ryan said. The brothers, Abid, Jamal and Imran Awan, worked as shared employees for various members of the House, covering committees relating to intelligence, terrorism and cybersecurity, which included the House Committee on Foreign Affairs, the Committee on Homeland Security and the Subcommittee on Tactical Air and Land Forces of the Armed Services Committee. Imran’s wife, Hina Alvi, and Rao Abbas, both of whom worked as House IT employees, are also under investigation. The group were banned from accessing the computers as a result of the investigation but, as of earlier this month, Imran Awan remains as an “technology adviser” to former Democratic National Committee chair, Debbie Wasserman Schultz, who was forced to resign in July following revelations that she worked to further Hillary Clinton’s chances of winning the Democratic primary at the expense of Vermont Senator Bernie Sanders. Last week, the Russian media reported that Turkey had imposed a 130 percent tariff on wheat, corn and sunflower meal that is making deliveries highly unprofitable for local businesses. Turkey’s Trade Ministry denied the reports, but a representative of the Russian trade mission in Ankara said Turkey had excluded Russia from a list of countries with zero rates of customs duties. Turkey is the second largest buyer of Russian wheat after Egypt. Russia will keep the ban on Turkish frozen meat and poultry as well as tomatoes, cucumbers, grapes, apples, pears, strawberries and other fruit and vegetables. In March, Rosselkhoznadzor lifted the restrictions against Turkish onions, cauliflower, broccoli and some other vegetables, explaining there is a lack of these food items in Russia. Food imports from Turkey were blocked in response to the downing of a Russian jet in Syria in November 2015. There were other restrictions, including the cancellation of charter flights to Turkey, the introduction of a visa regime, and a ban on hiring Turkish citizens. At the request of the Kremlin, Russian travel agencies suspended sales of package tours to the country. Moscow-Ankara relations began to improve after Turkish President Recep Tayyip Erdogan apologized over the jet incident. Russia lifted the flight ban, but the food ban has remained. Police arrested two people, including, reportedly, the son of a minister, as part of an ongoing probe into corruption suspicions at Israel Aerospace Industries, one of the country’s largest defense firms. Another 10 people were hauled in for questioning, police spokeswoman Luba Samri said. The two suspects were arrested early in the morning and their homes searched, police said. They are expected to appear at an arraignment hearing at Rishon Lezion Magistrate’s Court later Wednesday to determine if they will remain in custody, police said. One of the suspects is the son of a Likud minister, Channel 10 news reported. Police did not divulge the identities of those arrested Wednesday. 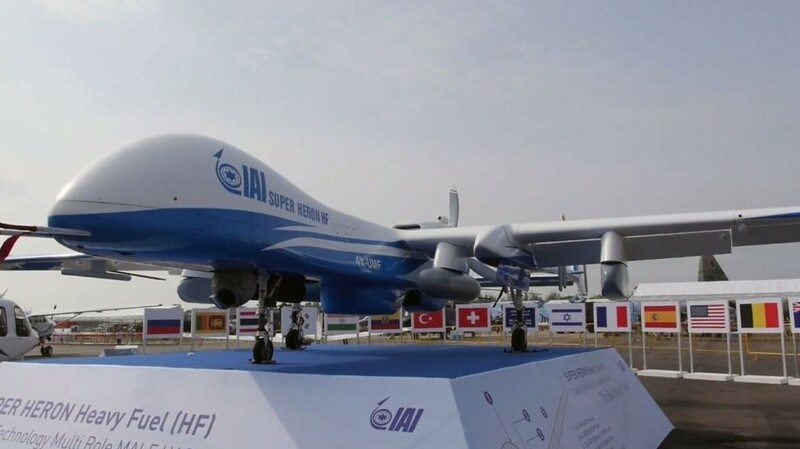 Suspicions of of corruption, fraud, and breach of trust surrounding IAI became public last week when police raided the defense contractor, arresting 14 people. The labor union at IAI, which employs some 16,000 people and is Israel’s largest state-owned company, is known as a Likud stronghold. “This is an extensive investigation, with a wide scope, which includes a number of sub-scandals, and raises suspicions of a range of charges — corruption, aggravated fraud, money laundering, theft by public officials, illegal business practices, fraud and breach of trust,” police said in a statement last week. Israeli jets were reported to have carried out airstrikes near the Syrian capital early Wednesday, hours after Prime Minister Benjamin Netanyahu vowed to continue hitting weapons convoys and rebuffed claims Russia had ordered the strikes halted. Syrian opposition news outlets reported that the airstrikes took place in the Mount Qasioun region near Damascus overnight. The Israeli raids targeted Syrian army posts in the area, the reports said, in the fourth round of airstrikes attributed to Israel in Syria in less than a week. There was no immediate confirmation from Jerusalem, nor any information on casualties or damage. A London-based activist and monitoring group said Wednesday that a U.S.-led coalition airstrike had hit a school in ISIS-held territory in northern Syria that was being used to shelter displaced families, killing dozens of civilians. The Syrian Observatory for Human Rights (SOHR), which relies on an extensive network of contacts on the ground in Syria and which generally proves a reliable source of information on the war, said coalition aircraft “most likely” carried out the strike but did not explain how it reached that conclusion. In a statement to CBS News, a spokesperson for the U.S.-led coalition said it had no evidence yet to back up the claim of a strike hitting civilians, but that all such reports were taken seriously and investigated. The coalition has targeted ISIS militants and infrastructure in and around the northern Syrian city of Raqqa for months. It is the terror group’s last major urban stronghold in Syria and its self-declared capital. Russian aircraft have also carried out one or two strikes in the area in recent months, but have largely focused on targeting groups other than ISIS. Both U.S. and Russian-backed factions on the ground are battling ISIS in an effort aimed at eventually retaking Raqqa. The Wednesday strike reportedly hit a school in the town of Mansoura, about 15 miles southwest of central Raqqa. U.S. intelligence agencies have concluded that Russia was behind Democratic National Committee hacks that aimed to boost Donald Trump’s chances of beating Hillary Clinton (file photo). 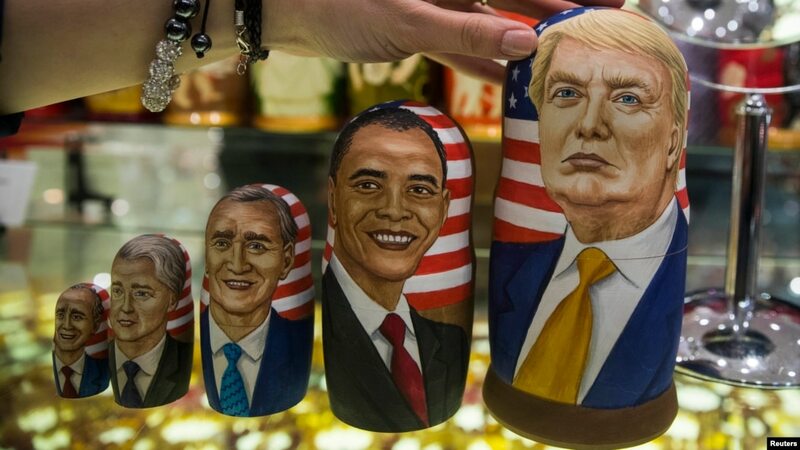 WASHINGTON — An influential British think tank and Ukraine’s military are disputing a report that the U.S. cybersecurity firm CrowdStrike has used to buttress its claims of Russian hacking in the presidential election. LONDON/ANKARA/DUBAI, March 22 (Reuters) – Iran is sending advanced weapons and military advisers to Yemen’s rebel Houthi movement, stepping up support for its Shi’ite ally in a civil war whose outcome could sway the balance of power in the Middle East, regional and Western sources say. Iran’s enemy Saudi Arabia is leading a Sunni Arab coalition fighting the Houthis in the impoverished state on the tip of the Arabian peninsula – part of the same regional power struggle that is fuelling the war in Syria. Sources with knowledge of the military movements, who declined to be identified, said that in recent months Iran has taken a greater role in the two-year-old conflict by stepping up arms supplies and other support. This mirrors the strategy it has used to support its Lebanese ally Hezbollah in Syria. A senior Iranian official said Major General Qassem Soleimani, commander of the Qods Force – the external arm of the Islamic Revolutionary Guard Corps – met top IRGC officials in Tehran last month to look at ways to “empower” the Houthis. “At this meeting, they agreed to increase the amount of help, through training, arms and financial support,” the official said. Iran rejects accusations from Saudi Arabia that it is giving financial and military support to the Houthis in the struggle for Yemen, blaming the deepening crisis on Riyadh. But Iran’s actions in Yemen seem to reflect the growing influence of hardliners in Tehran, keen to pre-empt a tougher policy towards Iran signalled by U.S. President Donald Trump. Russia’s force in Syria has suffered losses since late January more than three times higher than the official toll, according to evidence gathered by Reuters, a tally that shows the fight in Syria is tougher and more costly than the Kremlin has disclosed. Eighteen Russian citizens fighting alongside Moscow’s allies, the Syrian government forces, have been killed since Jan. 29 — a period that coincided with intense fighting to recapture the city of Palmyra from the Islamic State group. The Russian defense ministry has publicly reported only five servicemen’s deaths in Syria over the same period, and its officials’ statements have not mentioned any large-scale Russian ground operations in the fight for Palmyra. Military casualties abroad are not as politically sensitive in Russia as in some other countries but send a negative message ahead of a presidential election next year which is expected to give President Vladimir Putin a fourth term. The toll was revealed in interviews with relatives and friends of the dead men, cemetery workers, local media reports of funerals and evidence collected by a group of investigative bloggers, Conflict Intelligence Team (CIT). In each case, Reuters has independently verified information about the death by speaking to someone who knows the dead man. The casualties since the end of January represent one of the highest tolls for the Russian contingent in Syria since the start of Moscow’s military intervention 18 months ago. An official with the Russian foreign ministry referred questions about them to the defense ministry. The Russian defense ministry did not respond to Reuters questions about the casualties and about military operations in Syria. The Kremlin did not immediately respond to a request for comment. Most of the dead were not regular Russian soldiers but Russian civilians working as private military contractors under the orders of Russian commanders. Moscow has not officially acknowledged the presence of the contractors in Syria. For the first time in years, rebels demonstrated that they can threaten the capital of Syria, as fierce fighting continued for a third day on the northeastern edge of the city. BEIRUT, Lebanon — Syrian insurgents seized several government positions on the outskirts of Damascus on Tuesday in the third day of their most ambitious offensive in the capital in years, sending a sharp reminder that the war in Syria is far from over. Fierce fighting broke out on the northeastern edge of Damascus, as a mix of Islamist rebel groups and hard-line Qaeda-linked jihadists seized an industrial area about a mile from the historic Old City near the heart of the Syrian capital. Rebel offensives erupted in several other parts of the country. Government forces have been scrambling to repel the attack since it began on Sunday, bringing troops and allied militias from other front lines to hold their territory in Damascus, as government warplanes pummel rebel-held suburbs with scores of strikes. Rebel shells hit the city, wounding 15, and the authorities shut down many of the main roads. After the government seized the eastern half of Aleppo from rebels last year, it worked hard to create the impression that the war was essentially over. The recent activity, including a series of suicide bombings in Damascus and a rebel attack Thursday on the northern city of Hama, seemed to indicate that the war might be entering a new phase instead. BY ALEXANDER FULBRIGHT Russia must work to ensure that Iran is unable to establish a military presence in Syria that poses a threat to Israel and the region, the director-general of the Intelligence Ministry told Reuters on Tuesday. Chagai Tzuriel, who told The Times of Israel last month “the most important strategic issue we’re currently facing is the strengthening of the Shiite axis led by Iran in Syria,” warned that Iran is seeking to exploit its status as one of the main backers of the Syrian regime in order to establish a long-term military presence in the country. “Iran is in the process of putting together agreements, including economic agreements, with Syria to strengthen its hold, its ports and naval bases there,” he said. According to Tzuriel, the six-year long Syrian civil war has undermined the balance of power in the region to Iran’s advantage, which poses a threat to both Russia and other world powers’ interests in the Middle East. “When it comes to Iran, the United States, Russia and other powers need to understand that (growing Iranian influence in Syria) is going to be a constant source of friction,” he said. MOSUL, Iraq – Iraqi forces helped by U.S. airpower have clawed back much of this broken city from the Islamic State. But as you approach East Mosul, the military checkpoints on the rutted road are manned by members of Iranian-backed Shiite militias that now control the entrance to this Sunni Arab city. Rather than fly the red, white, and black Iraqi banner, the militiamen display a religious flag adorned with the face of the holiest Shiite icon, the prophet’s grandson Imam Hussain. Washington should regard the black flags as a warning signal. Even before the Islamic State is fully defeated, Shiite Iran is laying the groundwork to expand its deep penetration of Iraq. Tehran wants to control the Baghdad government through its Shiite political and militia proxies, marginalizing Sunnis, including in Mosul. But judging by history, repression in Sunni areas of Iraq will provide fertile ground for the next jihadi movement to take root. So the Shiite flags at Mosul’s gateway signal that a military defeat of the Islamic State is insufficient. There must also be a political plan (although none is yet evident in Baghdad or Washington) to assure Sunnis of a role in a post-Islamic State Iraq. That plan is needed sooner rather than later. So far, the Shiite militias are not entering the city proper, Mosul residents tell me. “Right now they are not pushing people out,” says an elementary school teacher who lives in East Mosul. He says, however, that sectarian Shiite political parties linked to the militias are already opening offices in the city. In other contested parts of Iraq, hardline Shiite militias are ethnically cleansing Sunnis from towns and villages to create a Sunni-free corridor from Iran across Iraq to the Syrian border. These militias receive extensive Iranian support and Iraqi government funds. Maslawis (as Mosul natives are called) view the Iraqi military far more positively than they do the militias, even though Iraqi forces are composed heavily of Shiites (who make up a majority of the population). That’s because Iraqi forces are loyal to the state, not to Shiite political parties or Tehran. Although the militias are technically under military control, no one knows their future after the Islamic State is defeated. Sunnis fear they will act as armed wings of competing Shiite parties or an Iraqi version of the Iranian Revolutionary Guard corps, which took over Iran’s army from within. The German government has refused approval for military exports to NATO partner country Turkey on a growing number of occasions. Ministers are concerned the weapons could be used to oppress the local population. Berlin has rejected more than 10 applications for arms exports to Turkey in recent months, the German daily “Süddeutsche Zeitung” (SZ) reports, citing a letter from the Ministry of Economic Affairs. The ministry was answering questions by the left-wing MP Jan van Aken. As a NATO partner, Turkey is rarely subject to restrictions on arms exports. But there are concerns that since last July’s coup attempt, Turkish President Recep Tayyip Erdogan has launched a far-reaching purge of political opponents. Turkish politicians have abandoned plans for more campaign events on German soil ahead of the April referendum, says the ruling AKP party. Previously, Angela Merkel threatened to ban such events over Nazi insults. The decision to halt referendum events was made in Ankara, a Cologne-based representative of Recep Tayyip Erdogan’s AKP party said on Tuesday. “All future events that were planned have been cancelled,” she told the AFP news agency. The move was a “gesture of goodwill” towards Germany, said rally organizers from the Union of European Turkish Democrats (UETD) who confirmed the cancelation to German news agency DPA. Turkish AKP politicians are eager to gain votes of Turkish citizens living in Germany ahead of the April 16 referendum. Roughly 1.4 million of them are eligible to vote. The controversial plebiscite would approve a constitutional reform to give the Turkish president more power. However, their attempts to hold campaign events in Europe sparked a thunderous diplomatic row that saw Erdogan compare German and Dutch officials with Nazis. On Monday, German Chancellor Angela Merkel had warned that Germany could ban all AKP campaign events if Ankara continued with Nazi jabs. Despite the AKP’s announcement on Tuesday, it remains unclear whether President Erdogan – who continued with the harsh rhetoric on Tuesday, urging his supporters to vote “yes” on the constitutional reform as a response to a “fascist” Europe – would also stay home. According to German media reports, Erdogan was planning to visit Germany. When asked about the reports, however, UETD General-Secretary Bulent Bilgi said that his organization “cannot determine” the president’s actions. The deputy director of the NSA says he believes states have entered the bank-robbing business. A senior National Security Agency official appeared to confirm that North Korean computer hackers were behind a multi-million dollar heist targeting Bangladesh’s central bank last year. Computer hackers attempted to steal $951 million, but only got away with $81 million, some of which was later recovered. After the theft, security firms quickly pointed the finger at North Korea. Other experts disputed that finding. But on Tuesday, NSA Deputy Director Rick Ledgett appeared to say North Korea was the culprit during a cryptic exchange at a Washington forum. Speaking at an Aspen Institute roundtable, Ledgett pointed out that private sector researchers had linked the digital break-in in Bangladesh to the 2014 hack on Sony Pictures, which the U.S. government attributed to Pyongyang. Espionage operations now extend to students, rather than focusing only on retired officials. The recent discovery that a former Chinese university student in Taiwan has likely been spying for the People’s Republic of China (PRC) may at first glance appear to be just another entry in a long list of PRC espionage cases against Taiwan. After all, Chinese espionage against Taiwan has been an ongoing security problem. Some estimates have identified as many as 60 cases of Chinese espionage against Taiwan since 2002, and this may represent only be the tip of the iceberg. However, the March 10 arrest of 29-year-old Zhou Hongxu for breaching Taiwan’s security laws suggests that China is expanding its espionage campaign against Taiwan in a number of ways. Zhou’s case is the first known instance of a Chinese student being used to spy in Taiwan since the island opened its universities to Chinese students in 2009. Zhou Hongxu first came to Taiwan in 2009 and enrolled in Tamkang University as an exchange student. In 2012, Zhou enrolled in a business administration program at National Chengchi University in Taipei. After graduating in 2016, Zhou left Taiwan in August that same year, but returned to Taiwan shortly afterwards under the pretext of business. After returning, Zhou sought out a junior official in the Ministry of Foreign Affairs, whom he had become acquainted with as a student, and allegedly attempted to obtain classified information in return for a free trip to Japan and an unspecified amount of money. According to prosecutors, it is believed that Zhou was instructed by China’s Taiwan Affairs Office to enroll at National Chengchi University for the purpose of spying. National Chengchi University is an ideal choice for identifying and recruiting future government officials and leaders. The school is one of Taiwan’s top social science universities and produces many of Taiwan’s government officials. It is home to Taiwan’s only diplomacy program, from which over 100 of Taiwan’s ambassadors have graduated, and it hosts a number of professional programs, such as the Master’s Program in National Security and Mainland China Studies, which is reserved for military officers and government officials. Apple’s iPhones and Apple IDs are a tough nut to crack for hackers, but it’s not be impossible. At least that’s what a group of hackers seem to suggest, as they’re currently attempting to blackmail Apple for up to $100,000 before they start remotely wiping millions of iPhones. Can they actually do it? Should you be worried? It’s unclear at this point. The hackers apparently engaged in conversations with the media to force Apple’s hand. The Turkish Crime Family hacker group, which spoke to Motherboard, want either $75,000 in Bitcoin or Ethereum, or $100,000 worth of iTunes gift cards. “I just want my money and thought this would be an interesting report that a lot of Apple customers would be interested in reading and hearing,” one of the hackers said. Apparently, the hackers have been in contact with Apple’s security team for quite a while now. They even posted a video on YouTube to prove they have actual access to iCloud accounts, access which can be used to remotely wipe iPhones. Apple, understandably, doesn’t appear to be willing to pay up the ransom. “We firstly kindly request you to remove the video that you have uploaded on your YouTube channel as it’s seeking unwanted attention, second of all we would like you to know that we do not reward cyber criminals for breaking the law,” a screenshot of a message purportedly coming from an Apple security team member reads. The hackers say they have access to more than 300 million Apple email accounts, including @icloud and @me domains. The number is the source of some confusion though, because a different hacker from the group claimed they had 559 million accounts in all. They have not explained how they gained access to Apple ID credentials. The hackers are threatening to move forward with remotely wiping Apple devices on April 7th, unless Apple pays up. Apple hasn’t publicly commented on the matter at this point. On the off-chance that the hackers are indeed holding access to millions of iCloud accounts, you might consider changing your password to protect your Apple ID.